As part of its Lessons from Our Nation's Schools series, Education World visited two elementary schools that use the Responsive Classroom approach to teaching and learning. In this second of two Responsive Classroom articles, Education World looks at how Responsive Classroom practices play out in schools and classrooms. (To read part one of the series, click Responsive Classroom Practices Teach the Whole Child.) Included: Descriptions of Responsive Classroom practices. Once the rules are in place and students understand logical consequences, teachers can move on to other aspects of the Responsive Classroom approach, such as Academic Choice, which gives students more flexibility in their learning. That could start with allowing younger students to choose how they want to explain a story -- with words, pictures, or another medium -- rather than just assigning them to write about it. Students also might be given the freedom to select their own research topics. While teachers work with individuals or groups of students, the rest of the class concentrates on "have to's," assignments they know they have to complete independently. As Flanders' staff learned, without Responsive Classroom basics, students can flounder with new freedoms. "The year I was hired, the whole school took a workshop on Responsive Classroom," said Flanders fourth grade teacher Andrew Dousis. "At first, we put a lot of effort into Academic Choice. We had solid Morning Meetings and solid communication, so parents understood what was going on. Then we realized we needed other things in place for Academic Choice to work." So, the staff focused more attention on Rules and Logical Consequences, to give students the skills for Guided Discovery and Academic Choice. Students with questions about assignments were encouraged to first approach a classmate for assistance. If that didn't work, they wrote their names on a sign-up sheet to speak with the teacher. "You have to have a sign-up system," Dousis said. "Otherwise, you're worn out. This is proactive rather than reactive. Two to three minutes of preparation time saves 20 minutes of reminders and interventions. That allows children to be socially ready for learning. One kid at the beginning of the year waited for me to help him with everything. Now he works independently." School staff members agreed that the comfort level of Responsive Classroom students with themselves, their peers, and the adults around them make them more confident learners. Click to read snapshots of these two Responsive Classroom practices' schools. "The children benefit because of the sense of community and responsibility this fosters," said Healy. "Children can't learn unless they feel safe. It's our responsibility to create a safe atmosphere." "You can trust everyone," added Ben, 10, a Four Corners student. "No one would ever do anything bad. You know the other kids would never hurt you or be mean to you. It makes it easier to learn because everyone is friends." Teachers and principals said the nurturing atmosphere created for students carries over to the faculty as well; teachers work cooperatively and support one another. "The whole staff is very cohesive; they care for children," Four Corners' fifth grade teacher Betty Gutierrez said. "In a traditional school, you shut your door and you're in your own world. Here, you are always mixed-in and supported. You can bounce ideas off everyone. Also, the parents are very supportive of the philosophy and the school." Teachers also talked about having "buddy teachers" to step into their classes for a few minutes if they need to leave the room for any reason -- including to regroup after a tough stretch. "When we changed the kids' rules, we changed the adult rules," McLaughlin said. "The adults have been more caring and thoughtful of one another." Although the atmosphere in Responsive Classroom schools sounds ideal, some teachers might wonder about the amount of work needed to prepare Responsive Classroom-style lessons. In fact, some more work might be involved in a Responsive Classroom-than in a traditional classroom, especially in the beginning of the year, but the benefits grow with the students. "Go slowly; remember the tortoise and the hare," Dr. McLaughlin said. "Spend more time up front; we spent more than a year reading and studying before we tried [the Responsive Classroom approach]. Now it is ingrained in the school culture. I make all decisions as if my kids were here, and this is good for kids." "If it's not a team effort, it won't work," added Healy. "I think if a group of adults puts effort into it, and does what's best for kids, it can work. We have lots of visitors, including teams of teachers. They ask how we make it work -- we tell them you have to work together; start small, start with small aspects of Responsive Classrooms. Here, we added a piece each year over nine years. It all fits in with how we build community." "It's not more work; it's different work," Flanders' McLaughlin said. "It takes constant tinkering to support the system. I can't think of a way Responsive Classroom is harder. There is some cost in terms of time and money, but the advantages outweigh the disadvantages." Planning lessons involves integrating more social learning into the classroom, said Flanders' first grade teacher Smith. "It helps to have a common language; everyone follows a common approach," Smith said. "I can talk about a student with a fourth grade teacher. You can see in the older grades that we made a difference here [first grade.]" Some do find themselves putting in more time. "It's a lot more work than when I first started teaching 28 years ago," said Carol Perkins, a fourth grade teacher at Four Corners. "I have some English-language-learners, some students reading at fourth grade level, and some at fifth grade level. I do a lot of modifications in behavior and academics. I have alternative book groups and meet with students in groups." Other teachers find it difficult to relinquish total control over the classroom so students can make more choices, but that comes with time. "Responsive Classroom is messy at times," said Dousis. "Yes, the teacher is a strong leader, but to be effective, you have to be in the mix, and that makes you vulnerable at times. The kids get to know you and one another very well; and that's scary for some people." Even with new strategies, terms, and inherent messiness, many teachers at a summer workshop said they were eager to try Responsive Classroom practices. Rosemary Salvas, a fourth grade teacher in Groton, Connecticut, said she became interested in the philosophy after taking a one-day workshop last year. Salvas has been using Morning Meetings in her classroom, but wanted to implement all aspects of the Responsive Classroom approach. "I'm going into my 32nd year of teaching; it's a whole new style," Salvas told Education World. "Learning the language is the hardest part." But she is pleased with the changes she saw in her class last year. "I like the sense of community it builds in the classroom -- the discipline problems are almost eliminated." Even in first grade, students' comfort level with the system was apparent. On a damp spring morning, Stephanie Barry's first graders at Four Corners filed into the room, checked off their names on a chart, and put a clothespin by their name on another chart to indicate if they wanted a hot lunch. Put away homework and folder. After completing the list, students sat quietly at tables; some tried to communicate in sign language with a classmate who is deaf and whose first language is Spanish. When Barry signaled the class, the children gathered in a circle on the rug for the Morning Meeting. They each picked up a piece of cardboard with his or her name on it, and started the meeting by greeting the person next to him or her by name, saying, "Good morning," and either shaking the person's hand or giving a classmate a high-five. Students usually rotate classroom assignments. On this morning, a student checked a thermometer on the window and gave a weather report to the class: 60 degrees and raining. Barry led them in a song, "Hello Neighbors," which is about community workers. The students also read a poem called "Dads Are," recited the Pledge of Allegiance, and played a game in place. Learning to be considerate listeners is a critical part of Morning Meetings. Every day, a child takes a turn in the "Sharing Chair" and talks about something he or she brought to class. On this day, a boy climbs into the chair and told his quiet classmates that he expects to get a dirt bike for his next birthday, and looks forward to riding it with his father. When he finished speaking, he told the circle, "I am ready for questions and comments." Students took turns raising their hands and asking questions about the dirt bike and the boy's travel plans. The routine was similar in Dousis' fourth grade class at Flanders. The room had no desks, just tables and computer workstations. Students handled most of the beginning-of-the-day chores: one student hit a chime, and asked who was buying a hot or cold lunch. Another announced she was collecting notes from parents. A boy approached Dousis while he was talking to a visitor and thrust a paper in his face. "Don't you see what is going on here?" Dousis asked, gesturing to himself and the guest. The boy returned to his seat. After exchanging greetings during Morning Meeting, a student displayed a picture of a horse painted by his grandfather. That week, students were taking turns sharing stories about their grandparents. Dousis quickly led the students through some games: Mirror Me, in which they imitate his body positions; Simon Says, which helps the students practice the names of body parts. ("Simon says touch your tibia.") They also guessed what number, person, and place Dousis was thinking of. When Morning Meeting was over, Dousis told the students, "Today you have a long research time. What do you need to do?" "Be quiet and work with your partner, if you have one," a girl responded. Students signed up to use the computers and to meet with Dousis if they had questions. "My job is helping with people, but you have to sign up," he tells the class. "It could be a while before I meet with you. So if you come up to me, I will ignore you." After students began working, Dousis alternated sitting, checking the sign-up list, and visiting tables. When he paused, a boy walking by hugged him and then continued on his way. When students were involved in their work, Dousis was able to leave the room and return with coffee for himself and a visitor, without first having to issue threats or bribes. The stable, predictable atmosphere agrees with students. "I like that the class is really organized, I like having time to do things on my own, and having time to research things I want to research," said one student, Lindsey, who was working on a project about toucans. The system also works on a school-wide scale. Four Corners holds monthly school assemblies to highlight a character trait; different grades take turns giving presentations. Parents are invited. For the May assembly on responsibility, all 450 students filed into the gymnasium and sat on the floor. When teachers gave the signal, the room was silent. For more than an hour during the assembly, students sang songs, watched schoolmates sing and read presentations, and received awards. Not one child was escorted out of the assembly for bad behavior. Teachers in Responsive Classroom practices schools have a lot of freedom in arranging their classrooms. Chess is a focus in Rick McAvay's first grade teacher at Flanders School. McAvay teaches all his students to play chess and coaches the school's chess team. "It's certainly more fun being here [than some other schools]," Healy said afterward. "They can sit for more than an hour, be respectful, and stand in front of a group." Principals at both Flanders and Four Corners schools said their schools made the transition to the Responsive Classroom system because of a need for a more consistent form of discipline. Both schools began the process by training staff members in aspects of the philosophy, adding more components each year until the conversion was complete. "We started slowly," Healy said. "A lot of us have taken the courses, and the Greenfield schools also developed a partnership with the [Northeast Foundation for Children] NEFC." The school requests that new teachers take part in the training; new teachers also can observe classes and work with mentor teachers. "The change was a long involved process," said McLaughlin. "We investigated different disciplinary systems." After 12 staff members took a Responsive Classroom workshop, McLaughlin was certain she had found what Flanders needed. Teachers began employing aspects of Responsive Classroom practices, such as Morning Meeting and Logical Consequences -- in their classrooms. "We had three trainers, who also did training sessions with custodians and cafeteria workers." Not everyone was convinced initially that the Responsive Classroom system was anyhing more than a lot of work and a lot of optimism. "I fought it in the beginning," said Michael Guarraia, a third grade teacher at Flanders School for 29 years. "I thought it was pie in the sky, and would never work. People told me it would be easier, but I didn't believe them. Now I find classroom management is much easier. The kids are more self-reliant and self-disciplined. In this atmosphere, kids want to behave." Usually all personnel in a school, including support and building staff, use Responsive Classroom language in dealing with children. "Consistency is really important; they hear the same language throughout the building," added Healy. Four Corners' custodian, James Craig, known as Bear (Mr. Bear to the students) is knowledgeable of the Responsive Classroom terms and procedures and uses them when he interacts with students. "I go to Morning Meetings. I have the freedom to speak to kids; I ask them how they are going to change something," Craig told Education World. "If kids make a mess, they have to help me clean it up, and talk about what they are going to do so it doesn't happen again." Just as some teachers needed convincing that Responsive Classroom was the way to go, many parents also were slow to embrace the change. "Initially, the parents were not pleased," McLaughlin said. "We invited parents to Morning Meetings, so they could see the skills their children were learning." The community, though, has been won over: last year, the PTA spent $6,000 on staff training. Have you read other stories in Education World's Lessons from Our Nation's Schools' series? 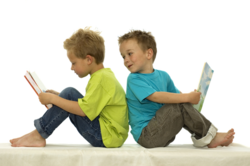 Click Lessons from Our Nation's Schools to read more! Now both principals said they have high parent participation in the schools. "We usually have about 50 parents at a monthly assembly," Healy said. "Family nights are very important. Twice a year, we have a family dance, math night, or literature night. This helps give parents information about the school and how kids are doing." A parent of a current and former Flanders' student told Education World she is pleased with how Responsive Classroom practices have affected her children's behavior inside and outside of school. "Personally, I love it," said Judy Cook. 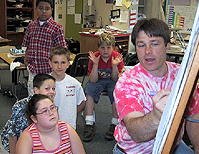 "I taught elementary school in Delaware, and used Responsive Classroom there. I think it gives kids structure and respect. And it's very supportive. The learned behavior fosters a sense of security -- it allows kids to take risks. They can flop and be okay. This builds cooperative learning and the consistency is good." The lessons carry through to home, too; Cook said she notices her children are more tolerant of each other. Responsive Classroom schools staff members, for their part, seem eager to learn more and share what they have learned. "This helps teachers and students feel like a part of the school," McLaughlin said. Just a few days of Responsive Classroom training at a summer workshop sparked excitement in teachers. Said one educator, "I can't wait to go back to school and be a whole new teacher."